If the role of a nurse is to teach patients and the public about healthy lifestyles, is it possible for an overweight or obese nurse to be an effective nurse? We know all too well that many of the chronic health issues seen today in the United States, including type 2 diabetes and hypertension, are related to diet and lifestyle. We’re taught in nursing school to encourage healthy lifestyles and teach patients and the public how to stay healthy. And yet we’re guilty of not walking the walk. A study published in May 2008 in the Journal of American Academy of Nurse Practitioners found that more than half of 760 nurses surveyed in six states were overweight or obese. When asked about issues with losing weight, 53 percent of the nurses in the overweight/obese group stated that although they recognized they should lose weight, they didn’t have the motivation to do so. It’s not always easy to get motivated to do something you know you should do. Losing weight is generally on that list. For a nurse, undertaking a lifestyle change required to lose weight may take more work and effort than it might for someone who works regular hours and in a less stressful environment. Irregular hours mean irregular eating times and perhaps difficulty squeezing in adequate amounts of exercise. If you haven’t planned ahead for meals and snacks, the only food available may not be what a dietitian would recommend for weight loss and health. Since extra weight can contribute to illness and perhaps lost workdays, could the workplace, which gives nurses the erratic schedules and high stress levels, be responsible for a nurse’s lack of health? Undoubtedly, a nurse’s skills have nothing to do with her body size. No matter who she is, her knowledge depends on three pounds, the average weight of a human brain. Retaining, assessing and processing information are no different between a nurse who weighs 120 pounds and one who weighs 180 pounds. But what of the physical work? Nurses who are mildly to moderately overweight may not have difficulty with the physical aspect of nursing, but the heavier or obese nurses may not be so lucky. That is a generalization, of course, but usually, the larger the person, the more effort it takes to perform a physical task like running up the stairs to answer a cardiac arrest code. When a nurse is out of shape, she is also more prone to injury. Patients and family members may not consciously be aware of it, but when they see the nurses who care for them, they make observations about the nurses’ behavior and appearance. If a doctor recommends a calorie-reduced diet or other restrictive diet, the nurse is the one who generally must answer questions and be available for patient teaching if the dietitian isn’t. To be honest, it’s not that different from the days when a doctor, smoking a cigarette in his office, would tell his patient that he should stop smoking because it wasn’t good for him. In the study mentioned above, 93 percent of overweight nurses recognized when a patient was struggling with obesity, However, only 24 percent of those nurses pursued the topic of obesity with those patients. This is a striking finding considering nurses are the frontline in healthcare. The people whom patients often turn to for advice and help are nurses. Nurses everywhere are making lifestyle changes. For example, Rosemarie Hernandez Jeanpierre, a Los Angeles–area LPN, became a spokesperson for healthy living, telling her story to major magazines and newspapers about how she dropped 110 pounds. Rosemarie, now a regular marathoner, undoubtedly started her weight loss journey with small goals—the kind that any nurse or patient can apply to his or her lifestyle. 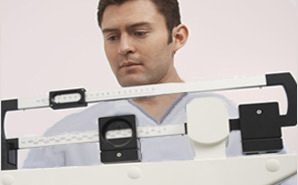 Do you think a nurse’s weight can have a negative effect on her work?